Getting Married? Talk about These Money Matters (Pt. 3) - Castle Rock Bankruptcy Attorney - Jon B. Clarke, P.C. Here is the conclusion to our three-part blog Getting Married? Talk about These Money Matters. While these financial questions can set up clear expectations prior to marriage, don’t hesitate to contact us if you and your spouse need help getting out of serious debt. Q4: How will our banking be done? In other words, will you and your soon-to-be spouse simply just keep on banking separately? 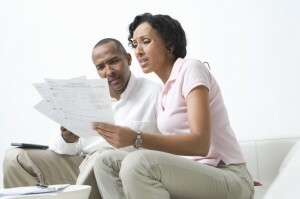 Will you set up a joint account and maintain your separate bank accounts? Or will you completely merge your finances into marital checking and savings accounts? How your banking is done may not seem like an important issue, but it very well can be, especially when it comes to issues like paying bills, investing in your savings and managing other financial responsibilities. With this money matter, it can also be a good idea to discuss whether you and your partner will set up direct payment of certain bills out of your account, how your account statements should come and who will take the lead in generally managing these bank accounts. Again, establishing this aspect of marital finances from the start can help clear up a lot of potential confusion while defusing future possible stress and resentment. Q5: What financial plans or steps do we need to make to prepare for building a family? When it comes to having children, most couples are focused on the issues of when this will happen and how many kids each partner wants. Fewer couples take the time to consider the how in terms of finances – in other words, how will we pay for the kids we plan on having and how we will instill financial responsibility in them as we raise them. While this is a nonissue for couples who don’t plan on having kids, for couples who do intend on building the family, it’s important to work out this aspect of marital finances before the marriage. Will you and soon-to-be spouse regularly invest in your savings? Do you want to purchase a home before having kids? What if you end up having twins – can your finances support this? Discussing these issues ahead of time can be critical to setting up your future family for success, financial stability and happiness. Colorado Bankruptcy Lawyers at the Law Office of Jon B. Clarke, P.C. If you are overwhelmed by seemingly insurmountable debt and are looking for a financial fresh start, contact the trusted Colorado debt relief and bankruptcy lawyers at the Law Office of Jon B. Clarke, P.C. For more than 35 years, Mr. Clarke and his diligent support staff have been successfully helping our clients resolve even the most complex bankruptcy cases for both individuals and businesses alike. Our experienced legal professionals are committed to providing each of our clients with the personalized debt relief assistance they need, and we will work tirelessly to ensure that our clients’ cases are resolved as favorably and efficiently as possible. For a thorough assessment of your situation, along with expert advice regarding the best manner in which to move forward to unburden yourself from debt, call us at (866) 916-3950 or email us some details about your situation by clicking here.